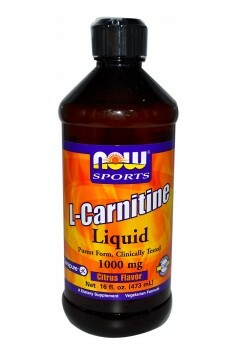 NOW FOODS Carnitine Liquid is a highly absorbable liquid supplement with l-carnitine and other nutrients on its list of contents. It occurs naturally in nutritional products but supplementation helps to keep its normal level. It helps to maintain the organism healthy. It has the purest form of l-carnitine, clinically tested and of plant origin. Vitamin B5 - found in many food products. It is important for the normal functioning of the organism. Its solubility in water prevents storing it in the organism. It takes part in the synthesis of vitamin D, fatty acids and cholesterol as well as in the process of releasing energy from ingested food. It supports the digestive system. It has a regenerative effect on skin cells and mucous membranes and it delays their aging processes. It is an element necessary for the production of haemoglobin and several hormones. Vitamin B6 - also known as pyridoxine, it is a component necessary for the normal functioning of the organism. Water-soluble, it occurs in the form of six interconvertible compounds. Having entered the organism, it is stored mainly in muscles and the liver. It participates in the synthesis of proteins and fat-soluble vitamins. It is responsible for the normal functioning of the nervous system, as well as affects blood pressure and heart functions. It has an influence on glycogenesis and it is necessary for haemoglobin production. Additionally, it helps to alleviate the feeling of tiredness and fatigue and to maintain normal metabolism. It affects the regulation of hormonal activity. Potassium - one of the three very important minerals present in every cell in the organism and in bones. Potassium's main task is maintaining, together with chlorine and sodium, the electrolyte balance in the organism. It affects the normal functioning of the nervous system. It transports electrical impulses in the nervous system and affects brain oxygenation. It maintains the right blood pressure and affects normal muscle functioning. L-Carnitine - an organic chemical compound with a betainic structure. It is a naturally occurring nutrient which plays an important role in metabolic processes. It is responsible for transporting long-chain fatty acids to mitochondria. The acids are then oxidised which leads to the production of thermal energy and energy stored in ATP molecules. Organic stevia extract - stevia is a plant of the Asteraceae family with exceptionally sweet leaves. Soluble in water and alcohol. It is used as a natural plant-based sweetener. Used as a safe sugar substitute, it has a beneficial effect in the case of hypertension and diabetes, as it does not increase the level of sugar in the blood. It does not cause the worsening of tooth decay. Helpful in weight loss because of a small content of calories. To sum up, the dietary supplement Now Foods Carnitine Liquid contains many nutrients which enable keeping the organism in a good shape. Recommended both for women and men, particularly for people who like sports. Dissolve one tablespoon (15 ml) in the mouth and drink plenty of water. Depending on the individual needs consume one to two portions (15 ml) per day. Choline, caffeine, or alpha-lipoic acid can help to increase the bioavailability of L-carnitine. It can be used every day and is recommended for people in need of extra energy and performing increased physical activity. De-ionized Water, Vegetable Glycerin, Malic Acid, Citric Acid, Natural Flavors, Potassium Sorbate (as preservative) and Organic Stevia Leaf Extract (Enzyme-Modified Steviol Glycosides). A preparation facilitating body mass and adipose tissue reduction based on CLA, L-carnitine and green tea. The supplement quickly and safely eliminates the excess of water from the organism.